COBO: A Revolution in Embedded Optics, or a Partner to Pluggables? Slow but steady advances were made in 2018 in on-board optical links for chip-to-chip and chip-to-module interfaces. The integrated-optics revolution, anticipated three years ago when the Consortium for On-Board Optics (COBO), of which Semtech is an associate member, was launched, has been replaced by a realization that only slow migration from traditional pluggable modules will serve the data center, whether within a single line card or server blade, or between cards and racks. Even as recent as a year ago, COBO members began rethinking and changing their tune to stress coexistence of pluggable MSA modules and the embedded on-board modules chosen by COBO as a de facto standard. The shift in COBO’s thinking resembles the changes seen at the turn of the millennium when proponents of tunable lasers softened their expectations and venture capital money poured into tunable laser startups with the assumption that such devices would quickly replace fixed single-wavelength lasers. Following the dot-com crash in the early 2000s, optical component manufacturers realized the tunable laser source would be treated as merely another arrow in the optical OEM’s quiver. Similarly, for very short distances across a single card, better performance by copper interconnect with improved PCB materials is calling the need for on-board optics into question. Meanwhile, though COBO was targeting applications at 400G and beyond, the emergence of QSFP-DD and OSFP pluggable form factor solutions for 400G/800G has pushed out the need for COBO solutions perhaps to 800G and beyond. COBO faces another unique problem because of the nature of its membership base. Last year, the consortium accepted an electrical connector standard for VSR applications, based loosely on TE Connectivity’s Sliver module product line. The module is based on 50Gbps PAM-4 signaling, which represents the new mainstream for optical components. However, some COBO members see a benefit in sticking with their own on-board optical modules. From a semiconductor supplier point of view, the basic building blocks required to implement COBO modules versus pluggables are identical. However, the physical constraints of the designs are different and thus different variants of the chips may be required for the different imlementations. 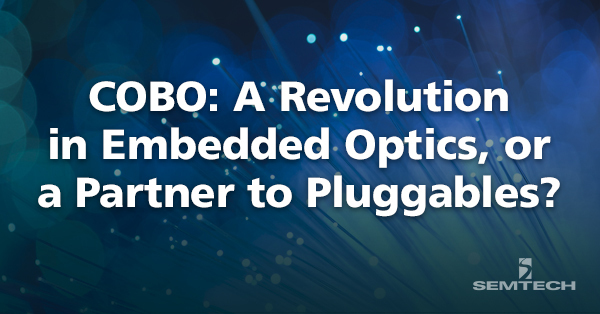 Furthermore, traditional optics may not be feasible to implement within COBO style modules and newer technologies such as Silicon Photonics may need to be leveraged to deliver a solution for COBO. Even Silicon Photonics technology comes in many flavors with differing IC requirements, thus close interplay between IC suppliers and Optics suppliers will be needed to deliver successful solutions. It should not hurt COBO to have some members opt for proprietary designs while some members use a Sliver-like standard. However, this diversity shows that the move to on-board optics will be gradual and filled with many implementation options. The revolution originally promised by COBO will follow a slow but steady path forward, with inevitable changes in direction along the way. This blog is the first in a new series on Signal Integrity industry trends. Subscribe to Semtech’s monthly blog digest for regular updates, or return to the blog in the following weeks for more insights. Learn about Semtech’s application for networking and optical communication, and download the Optical & IC Selector Guide. Semtech will be at the OFC Conference in San Diego March 5-7. Request a meeting with Semtech at OFC.